Hello April! 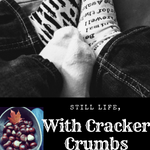 | Still Life, With Cracker Crumbs.. I always like to start the month by thinking ahead to what this month might bring, and what we might do. It is the month of the pink moon, named because of the pink phlox that blooms in April. April’s full moon also has a few different names, but I really like the thought of a pink moon – which might be slightly influenced by Nick Drake’s song, which really is so beautiful. Spring is definitely here, although we might have some snow still this month yet! The weather has been so gorgeous, we were able to get outside and play for a bit. We have plans for our garden, we are even planting a cherry tree in our backyard and I can’t wait! We are also working on sprucing up our porch so we can do some porch sitting – in fact, I might try to steal a few minutes with some coffee out there today, if I get the chance. Maybe at naptime I will sneak out and just sit and listen to the breeze rustle the branches which are just now budding, the birds chirping away, my woodpecker couple who like to hang out in front. I like to hear their knocking for some reason – it feels comfortable in a way I can’t describe. Since the 22nd is Earth Day, we want to try to make some more lifestyle changes, swaps that we can make, different things we can do to do our part in protecting and saving and reviving this planet we all share. We have done some small things already, like swapping to shampoo bars and regular bar soap, cutting down on our plastic in the shower. We have a reusable straw for the kiddo that we take with us when we go out, and I have started carrying our own silverware in case we we need it as well. I have some ideas that I am going to work on and I am looking forward to our new changes! I will be sharing our how they work out with all of you, and I would love to hear different things that you do too! Easter is this month as well – our family celebrates but not like we do other “big” holidays. Usually something small and easy, and really for the kids to see their grandparents more than anything. I am looking forward to dying Easter Eggs with Wyatt this year, I think he is really going to enjoy it! This month is about spring and cleaning and getting outside planting and just enjoying the nice weather for as long as we can. And is there anything better than a nap with the windows open, a just cool enough breeze drifting over you, as you drift off? Or a sleep after a long day outside? I know it is one of my favorite things! Ooh, a cherry tree?! Awesome! Spring is definitely here in the Bay Area as I think we’ve gotten over the last of the rain. We are having some temps with a toehold in the 70’s. That sounds like perfect weather to me – fall and winter are my favorites but if it’s warm, I love the 70s! Lol. I am super nerdy excited about our new tree! Lol. I love spring but even more so this year, seems like, maybe because it was kind of a tough winter. Anyway the last few days have been gorgeous! I agree – this spring was much needed after the winter that seemed like it would never end! Today is a bit cold again, but I know now it is just a temporary thing. Lol.